This Adult bib is not just a "Plain Jane". 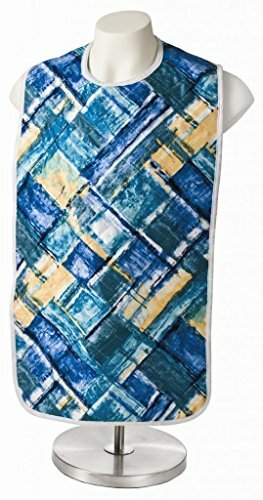 This multicolor, stain hiding, waterproof "Picasso"clothing protector sports a colorful palette of greens, blues and golds forming it's own fashion statement with a soft 100% polyester tricot top layer. Underneath the colorful first layer of tricot is the 8 ounce soaker material that absorbs and holds moisture. It is backed with a woven vinyl layer providing the waterproof barrier that protects clothing and the person wearing this clothing Protector from scalding hot drinks, cold beverages or staining food. Other benefits of this bib include an adjustable velcro closure to accommodate varying sizes of necks, heavy white binding that presents a nice finishing touch to keep all of the edges of this Adult Bib looking sharp and neat for a long life of service. This one size fits all (18" X 34") not only protects the upper body but also the lap area. The quality construction and institutional grade materials of this very durable adult bib or clothing protector is outstanding and will provide protection from stains and liquids while retaining their great looks through hundreds of laundering cycles. Picasso (multicolor blues, green and gold) standard 8 ounce soaker - middle absorption layer. The "One Size Fits All" is 18" X 34" and has an adjustable velcor closure. Woven Vinyl backing for clothing and body protection. Washable and reusable for cost saving - earth friendly. Top layer is 100% polyester triot for a soft touch with a heavy white edge binding. If you have any questions about this product by Western Textile, contact us by completing and submitting the form below. If you are looking for a specif part number, please include it with your message.